Treat your family with this quick and easy Stuffed Bell Peppers recipe. Just gather the few ingredients needed and follow this guide to some good eating! *Cut thin slice from stem-end of peppers and remove seeds. Fish serre is a traditional Garifuna dish that is a perfect marriage between fish, coconut milk, green plantain and vegetables. This recipe may seem complex to a novice cook, but by following these short steps, you and your family too can enjoy this hearty meal. *Dice pork fat and fry on low heat; add onion and brown slightly. *Grate plantains, mix with a little coconut cream and salt and form into small dumplings. *In a large pot, bring coconut milk and water to boil; add pork fat, onion, whole habanero pepper and garlic and any other vegetables of choice. *Add fish and then drop the plantain dumplings one at a time. Cook for about 15 minutes more. 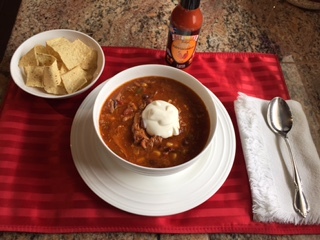 We tried this recipe with tender rabbit meat and Hot Mama’s Belize Hot Sauce which made for a wonderful bowl of happiness. This recipe is served topped with shredded Cheddar cheese, a dollop of sour cream, and crushed tortilla chips! Happy Eating! Place the onion, chili beans, black beans, corn, tomato sauce, and beer in a slow cooker. Add taco seasoning, and stir to blend. Lay chicken breasts on top of the mixture, pressing down slightly until just covered by the other ingredients. Set slow cooker for low heat, cover, and cook for 5 hours. Remove chicken breasts from the soup, and allow to cool long enough to be handled. Stir the shredded chicken back into the soup, and continue cooking for 2 hours. At this stage, add and stir in some Hot Mama’s Belize Hot Sauce to spice it up….